Life is amazing beyond words. I apologize for the tiny photos, but they’re all I have at the moment. 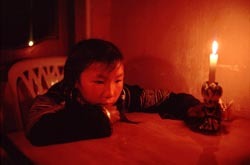 Pictured above is a Hmong girl named Shu. 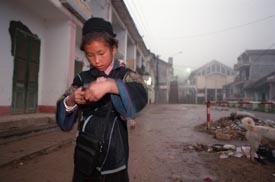 We met her 10 years ago, almost exactly to the day, high in the hills around Sapa. Shu grabbed my hand and won my heart as she led us through the countryside and home to meet her family. When we returned to the United States, I wrote a story about our encounters. The article was published in Kyoto Journal. It won an award and it accrued something of a followingâ€”fellow Americans who came to adore this vibrant little girl. Really, I can’t do the story more justice here than I did when I first wrote it, so please please read it if you’re interested. For years, I have wondered what became of Shu and her family. Yesterday, she sent us an email. 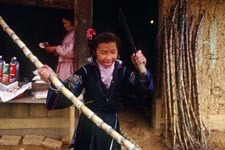 She had searched the Internet for her name and came upon the story of our days together in Sapa. Shu and her family are doing just fine. 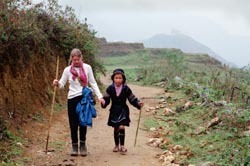 She has a daughter of her own now, and she established a nonprofit trekking business with the help of a few foreigners. It’s hard for me to imagine this little, lovable girl all grown up. Stories always go on, long after they are printed. Just like life, and the happiness we get in meeting people along the way. Next year, I will try my best to return to Sapa. Amazing. Little to add, except that I second that emotion. Sometimes brief encounters with story subjects have a long afterlife. Cool things happen! this is an interesting story.. good luck catching up with her.. Such a beautiful story, I’m glad you reconnected. That’s what it’s all about. Jerry’s sister Joanna used to work with me, and showed me your story about Shu when it was published. I’ve remembered it ever since. It is very cool that Shu found you! I came across your website a few weeks ago while researching for a trip to Asia. While much less significant than your reconnecting with Shu, it has been fun for me to make the connection back to that story from Joanna all those years ago. Great blog and website! Ed, that’s absolutely true. It seems to happen a lot in Cambodia — Jerry and I frequently bump into people we met while working on stories years earlier. Julin, it’s very nice to hear from you. Glad to hear you are planning a trip this way. I hear from Joanna you’d like a few travel/restaurant recommendations. We’ll get something together and send you an email…. Thanks Karen, that would be great. We will be in your part of Asia for a relatively short period of time–5 days/4 nights in Siem Reap and a few miscellaneous days in Bangkok for connections (however we will be in Bhutan 2.5 weeks). But any advice you have would be much appreciated. From what I have been reading about Cambodia I know I will have to come back for a more extended visit soon. I still have the (1st) picture of Shu on my desk at home. I’m glad to hear that she is doing well, esp the business. Hard to believe it’s been 10 years, and she’s a mom now! Impressive to say the least! You just couldn’t make up a story like that if you tried. It just shows how a tiny touch can make such a huge difference to someone’s life. It happened to me more than once in my life in the UK – it’s not just a tale of westerners and people in developing nations. And it’s been a real source of pleasure to me that I’ve been able to return the favour for a few people in my own little way.